This interview just popped up in my google alerts..
Q. When you look at the top four seeds here, knowing how comfortable you all are on grass, how strong would you say those four players you, Roger, Andy and Novak are right now? RAFAEL NADAL: I think we are playing well. I think Novak had a fantastic season. The first six months was really unbelievable. Roger, I think, had a very good season, and especially at this last tournament in Roland Garros played fantastic, in my opinion. Well, I did very well the first six months. I lost a few finals, but I was in all the finals. I won three, and I won Roland Garros a few weeks ago. Was a very important title for me. And I'm here. Forget about the past. Just looking about this tournament. Going to be always a big challenge. But I love to play on grass. I love to play in this fabulous place. So I am excited to be back here. Q. I was wondering, Andy Murray said today that he took inspiration from a conversation he had with Jose Mourinho last year. I was wondering which sportsmen you might have had conversations with in the past who have given you inspiration, a fellow Spaniard, maybe someone from a different sport? RAFAEL NADAL: Well, I never had idols. I love the sport in general. For me the sport in general is the inspiration. Because watch the sport from the TV or live is something special for me. I love to do it. When you see some emotional moments on the TV in different events around the world, tough situations, that's inspiration, no? And just have the chance to live one of these moments in my sport, on tennis, that's something really, really excited for me, no? So my inspiration is every day. For me I love to play big matches. I love to play in big stadiums like here, historic stadiums like Wimbledon. So for me, tomorrow I start playing the first match of the tournament in the Centre Court; for me is a dream. Seriously, that's my inspiration, trying to live these moments. Q. Have you been inspired by Rory McIlroy? RAFAEL NADAL: For sure, what he's doing is really something unbelievable. I met him in New York last year. Well, I love golf. I follow almost every week the tour. Seriously, I love watching Rory, no? He's probably one of the nicest swing in the world, if not the nicest. Seriously, is fantastic watch him what he's doing in this tournament. Always I will be supporting him this afternoon, because I think he deserves the title. He's playing better than other one. He had a very tough fourth round of Augusta this year, and he deserves to win a major because, in my opinion, right now he's playing at a different level than the rest. So for sure is an inspiration. I admire him a lot. Q. You said a few moments ago you love to play on grass. Q. Why? What do you enjoy about playing on grass, and was it that way for you from the beginning or did it come eventually? RAFAEL NADAL: I always liked. I said one thousand times that my dream always was play well here in Wimbledon. That's true. In the beginning of my career everybody talked a lot that with my style of game gonna be always very difficult to play very well here. But I worked a lot and I put all my best in every practice. I did my best since the start of my career to play well here, playing the week after Roland Garros, coming here one week before, having the right preparation as much as I can to be ready for this tournament. And the grass, the only problem of grass sometimes, is if you play against a big, big server, because the game is too fast and is not nice to play, no, because you feel that for a lot of games you don't touch the ball, no? But if you play against a normal player, a good serve that you can return the ball, in my opinion, the game from the baseline is fantastic to watch and is fantastic to play because you can slice, you can go to the net, you can play aggressive. If you play too defensive is impossible to play here. But you have different options to do. I love to do that. Q. How comfortable are you approaching the net on grass, and have you tried to incorporate that more and more in your game? RAFAEL NADAL: Always is the same: If you are playing well and if you have the confidence to hit the good shots, you gonna be closer to the net and you gonna have more chances to go to the net and to finish the points there. That's true. On grass, the surface helps you to go a little bit more to the net. That's something that is not a problem for me. I don't have the volley of Roger, for sure. But I think I'm fast and my movements are enough good to go to the net. Seriously, with no any ball, but go to the net with a good ball, I think I have enough experience and I have enough good volley to do it. Q. What were your thoughts when you heard there would be a rematch of the Isner match, and what do you remember about last year's Isner Mahut match? RAFAEL NADAL: Well, sorry for them (smiling). No lucky first draw, no? Because both players have a very good potential to play very well on this surface: big serve, good with the serve, good movements, good volley both of them. So is tough, because one of them gonna be out the first day. Last year was a fantastic match. Probably what the match means for everybody was fantastic to watch, but tough; was too many aces. But the attitude and the example what they show the rest of the tour and they show the kids was, in my opinion, fantastic with the right attitude all the time, fighting all the time, spending 11 hours on court. That's something almost impossible to repeat. So was one of these matches that gonna be in the memory of this sport forever. So that's something special for both of them. The only thing that I can do is congratulate them for what they did last year, and good luck for both of them this year. Q. How excited are you with the Olympics coming to London next year, basically two Wimbledon tournaments next year? How much of a goal will that be for you in 2012? RAFAEL NADAL: Olympics are a very special event. The experience that you can live on the villa, and, you know, live these moments with the rest of the sports people, that then is something special, no? And for me be there in Beijing 2008, enjoy these two weeks on the villa with the rest of the sportsmen around the world, but especially from Spain, was unforgettable for me. Be in the ceremony of the first day is something that you don't know if you gonna have the chance to repeat in your life. I enjoyed a lot this experience. The Olympic spirit is very special for these sports that they don't have the same luck than us. We have a tour. We have a lot of people working for our tour and having everything. That's true. You watch a lot of sports, a lot of sportsmen, they try they best, they practice as hard as they can for four years specially for that event. I know all the categories have World Cup, everything, but the Olympics are the more important thing. Probably that's a lot of pressure for them, and sometimes they don't have enough facilities to keep working for the next four years. So is something for me very difficult to explain in English, but I have a really strong idea about that. Q. You're looking forward to coming back to Wimbledon twice in a year? RAFAEL NADAL: For sure, yes. I hope so, if I qualify (smiling). If not, wild card (laughter). Q. Can you tell us what you've been doing since Queen's? RAFAEL NADAL: I've played fantastic rounds of golf. (Laughter.) Best two weeks of my life in Mallorca, yeah. I went out for one day for party with the friends. I stay with the family. I spend the weekend with friends, family, relaxing a little bit. That was something I needed. I didn't spend the weekend at home since the Davis Cup of Belgium in February, so I needed. I enjoy a lot. Monday I started to practice. Tuesday, too. Wednesday I was here practicing in afternoon. So that's all. Q. You've won four of the last five major events, and now you're closing in very quickly on Roger's 16 major events. RAFAEL NADAL: No. Very far. 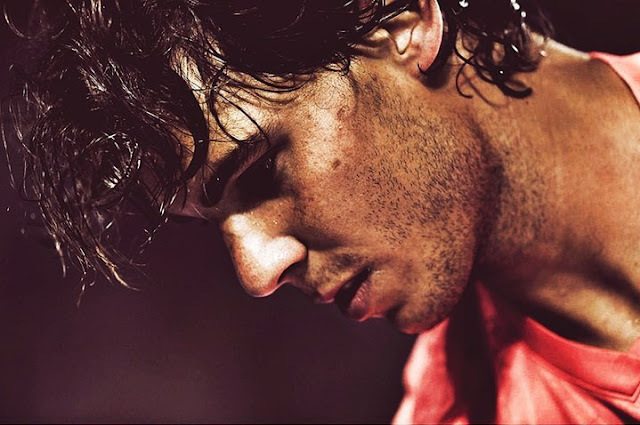 RAFAEL NADAL: I am not close than the 16 of Roger's; 16 is a lot. What do you think (smiling)? Q. It could be three or four by the end of the year if you win here and the US Open. RAFAEL NADAL: Yeah. I don't know. We can dream about a lot of things. That's dream a lot. For me is a dream. Maybe not for you. You watch that in a different perspective of mine. I saw that very, very far, how tough, how competitive is this sport. Last year was, in my opinion, very impossible to repeat: three Grand Slams in a row. So this year I am very happy about what's going on the season. But repeat what I did last year is something that I for sure don't think. Q. Do you think turning 25 you're still improving as a player? Are you getting better all the time? RAFAEL NADAL: I try. I don't know. Q. Do you think you're a better player now than you were at 22, 23? RAFAEL NADAL: In 2008 I play very well, too. I don't know, no? I think I try my best every day to keep improving my tennis. I wake up every day in order to practice with the illusion to be better player than day before. But be better player doesn't mean that you going to win more. Because win or lose depends of different facts and small things. So I think I'm more complete player than few years ago, I am sure on that. I am sure that I am a better player. Q. Can you describe what you think the pressure is on Andy Murray here at Wimbledon in his home country. RAFAEL NADAL: Well, the pressure is tough, but at the same time, the support is high. So I prefer have this pressure than don't have this pressure. That's what I can answer this question, no? That's true, play at home one Grand Slam is something special. Lot of people talking about his victory or he can win. Is true. But at the end of the day, in my case I don't know for him but I can talk about my experience. I don't read a lot about the newspapers talk about me or about the television says about me. I try to be focused about myself. For sure is very special play at home. But when you go on court and see all the crowd supporting you is something very, very emotional and very special. I would love to have this feeling.